Two more terrific Machine of Death Monologues are now up, done by Orpheos! Episode 5 – Together: A man seeks out the woman he wants to spend his last moments with. Episode 6 – Labels: A young woman tells the story of her treatment after her manner of death is revealed to be an as yet undiscovered illness that looks set to plague mankind in the future. Machine of Death Monologues Now Up! 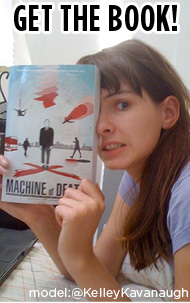 A while back, I mentioned how Orpheos Productions was doing some really cool: Machine of Death Monologues! There was just a trailer up then, but the first four (FOUR) videos are now up, and they’re really great. Are you looking for 40 minutes of entertainment right now? YOU CAME TO THE RIGHT PLACE. <— that link is the right place, where the videos are posted! The full site is here, and they’re adding monologues every few days, including a new one this Saturday. Here’s the first four – enjoy! Episode 1 – The Perfect Place: Karen records a birthday message to her grandfather, telling the story of her work’s Christmas do. Episode 2 – The Error of Arthur Schopenhauer: A young student is given a lesson in the harshest aspects of freedom. Episode 3 – Shaken: When administrator Sarah finds out that her death will be by ‘poison in the pages of a book’ she is convinced that she is destined for great things, or at least a great death. Episode 4 – Name Your Fear: When Alice receives her manner of death, it doesn’t give her the peace of mind she’d hoped for. Haunted by a mysterious name, she attempts to make sense of her loneliness. I’m really impressed by these – great writing, great acting, great production values, great fun. Nicely done, everyone! Comments Off on Machine of Death Monologues Now Up!